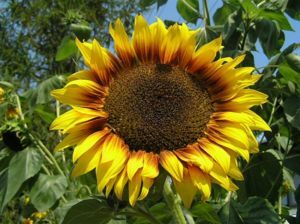 The Sunflower is a plant with a large, yellow flower, that is also a source of food. Sunflower seeds can be eaten and made into vegetable oil. The Sunflower is native to North America, and was a key food crop for native peoples. Birds and squirrels also eat sunflower seeds. The plant grows well in warm weather and full sun. Their roots grow deep and wide. There are many varieties of sunflower, some grow to heights of over 5 feet. The giant sunflower can reach 20 feet tall. The sunflower will always point it's face towards the sun. The sunflower is the state flower of Kansas. This page was last modified on 27 June 2016, at 20:32.